N O T E ; Before testing t h e sensor, check for HVAC DTCs (see page 21-101). 1. 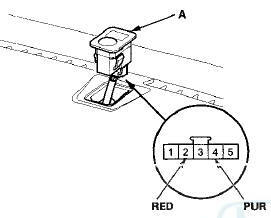 Remove the sunlight sensor (see page 21 -186). 2. Turn the ignition switch to ON (II). Measure the voltage between the terminals with the (+) probe on terminal No. 4 (with automatic lighting sensor) or No. 1 (without automatic lighting sensor) and the ( вЂ” ) probe on terminal No. 2 with the connector connected. NOTE: The voltage readings will not change underthe light of a flashlight or a fluorescent lamp. Voltage should be: вЂў 3.6вЂ”3.7 V or more with the sensor out of direct sunlight. вЂў 3.3вЂ”3.5 V or less with the sensor in direct sunlight. 3. 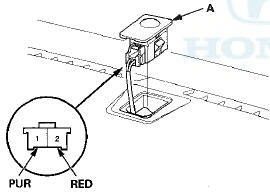 If the voltage is not as specified, replace the sunlight sensor (see page 21-186).